The one and only Ofe (Owerri) Owere. This soup has caused so many arguments between cooks. A lot of people have tried to make it and ended up with ofe Uziza, Ofe Achi, or ofe Ede’ i.e. cocoyam soup. “I shake my head when I see or read some recipes about our dearly beloved Ofe Owere. Typical Owere people will tell you that there is no controversy whatsoever about this soup. It is the ‘foreigners’ who in bid to reconstruct and add some twist to the soup that made it controversial. Ofe Owere is not cheap. This is because it is rich, flowing with milk and honey ‘LOL’. It is supposed to be a one day kind of soup. That is why we say “onye arii ego ejila erila Ofe Owere” How many people can afford to cook and finish a pot of soup daily? Traditionally, Ofe Owere has two basic vegetables: Ugu i.e. 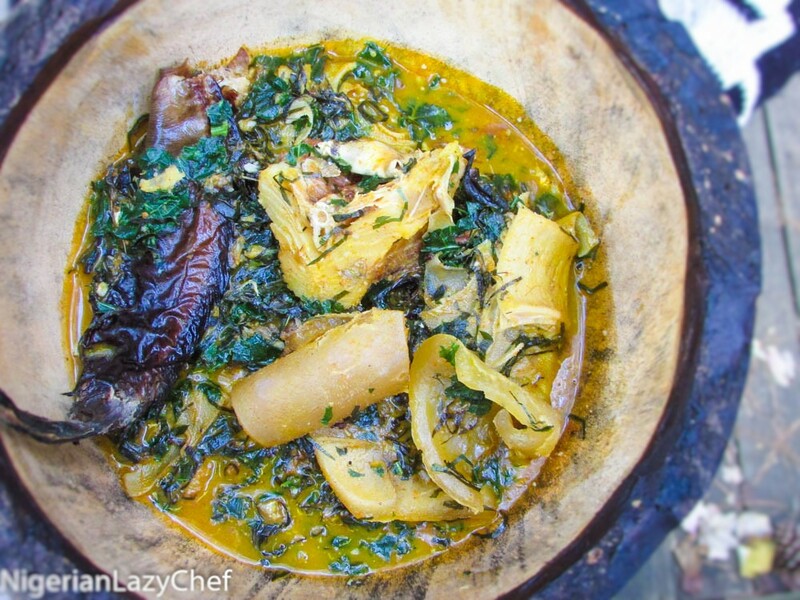 Pumpkin leaves and Okazi. Do your research. Go home and ask our mothers; adding Uziza is a borrowed thing(Alien). 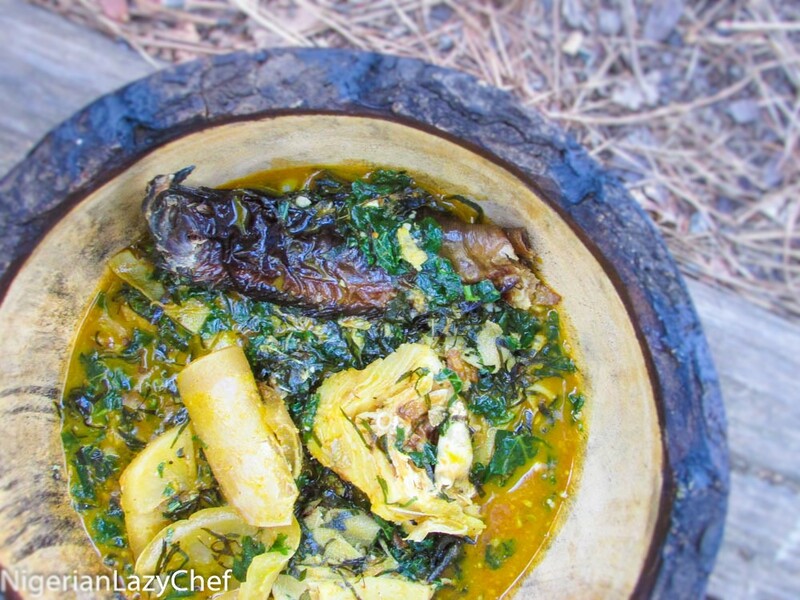 Uziza goes well with practically every soup though, but it is not a basic Ofe Owere ingredient. When Oha is added, that’s Ofe Oha. If an’ara leaves are added, that is Ofe an’ara. However sometimes people add all sorts of vegetables based on their own taste, choice and availability. But those vegetables should not be linked to the traditional Ofe Owere. It’s like telling an Efik person that EdikangIkong is cooked with Oha leaves just because you added it to yours and it tasted nice. 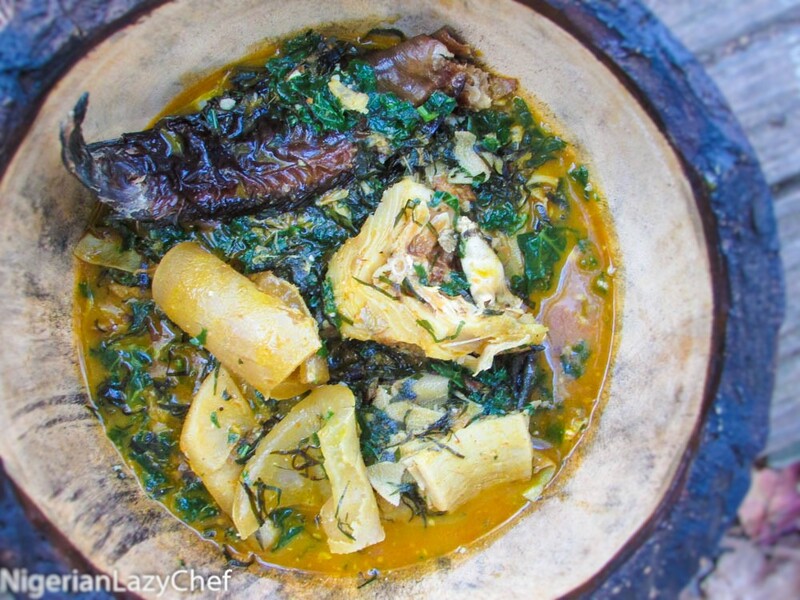 The traditional Ofe Owere consists mainly of chuncks of stockfish(Okporoko) and Azu Okpo(dried fish). Snails and other assorted meat add to the beauty and richness of the soup depending on your pocket. Periwinkles(Isam) is actually not an Owere thing, it is added just for ‘effizy'(swag). 4.Traditionally, Ofe Owere has a light runny consistency. ‘Ori na gorogoro.’ It is eaten with a spoon along side the utara ji(pounded yam) or whatever staple you eat with it. But sometimes(depending on one’s preference) it is cooked thicker and dipped into with the staple. I quite agree with the fact that you can tweak local dishes, but never should they be taken away from their originality. Not quite long ago, I was watching a video where a lady was making Nsala Igbo(Igbo white soup) and she added onions and cocoyam. I cried myself a river because I did not and could not really say anything. I just watched, cringed and cried myself that river 🙂 Way before that video, I saw a picture of some Egusi soup made with Oha and the person who had posted it said “Oha soup, Igbo kwenu” Kaii, I had to call my friend and rant. I was so upset, but I left that soup to the gods 🙂 Fortunately, the mistake was fixed and I heaved a sigh of relief. There are just some local recipes you do not tweak; you just don’t oh! This soup’s traditional recipe has been tweaked so many times and it has lost its ‘originality'. There are some very basic ingredients but you can tweak it to suit your budget and taste. According to my grandma, the real Ofe Owere is not made with meat. Rather it is made with 'correct' dry fish and stockfish but long throat won't allow us cook meals nowadays without meat. LOL. 6-7 pieces of Ede (cocoyam). You can substitute this with Achi - a very popular soup thickening agent. You may not have the time to go through the stress of preparing the cocoyam paste for soup when Achi can suffice but Cocoyam is the REAL DEAL in Ofe Owere. When cooked, peel off the skin and pound into a paste. The cocoyam is usually sticky so add a tablespoonful of palm oil. 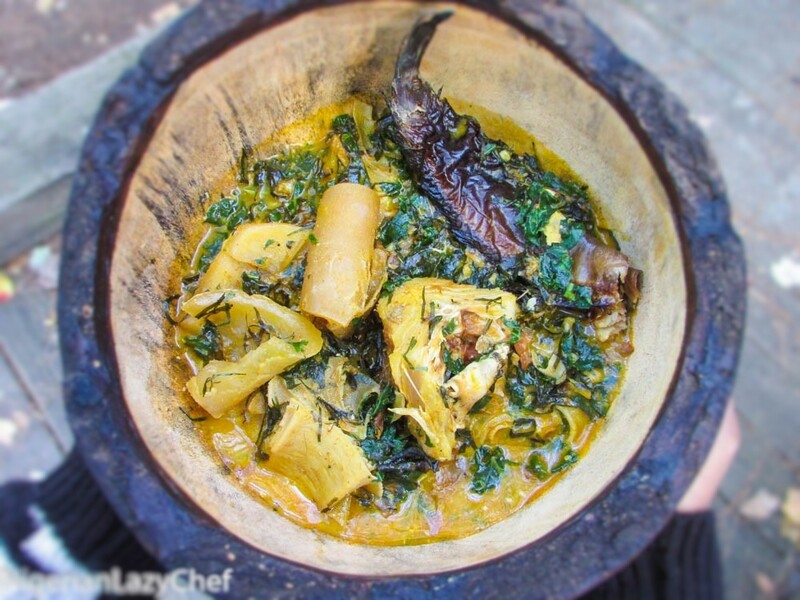 This does 2 things: it keeps the cocoyam from sticking to the mortar and also it enhances the color of the soup. Once the meat and stockfish have softened, taste the stock and make any necessary adjustments to the flavor. At this stage, add the cocoyam paste in small portions with your cooking spoon or simply mix the ground 'Achi' powder with some water in a bowl, stir well and pour into the soup. Reduce the heat and watch the soup thicken. Stir thoroughly to ensure all cocoyam lumps dissolve totally into the soup. The soup could be runny or thick. Or it could be just in-between. Your choice. Stir often if you are using Achi because the Achi may settle at the bottom of the pot and cause the soup to start burning. Add the ogiri, the remaining crayfish and dry pepper and stir thoroughly. Stir after adding the vegetables and allow to simmer on low heat for an extra 5 minutes then turn off the heat. Serve with your choice of 'swallow' i.e. fufu, pounded yam, plantain flour or eba. This entry was posted in Beef, Beef stew, Bulgur Recipes, Bulgur wheat, Carbohydrate, Local dishes, Lunch, Lunch ideas, main dishes, main meals, Meat dishes, Meat stew, Nigerian Casseroles, Nigerian local soups, Nigerian sauces, Nigerian soups, Nigerian Stew, Nigerian stews, Pepper soup, Peppersoup, Protein, Protein Dishes, Sauces, Side dishes, Soups, Southeast recipes, stew, Stews, Swallow, Uncategorized and tagged how to make ofe owerri, Igbo soups, Local Nigerian soups, Nigerian food blog, Ofe owerri recipe, Ogiri, Owerri soup recipe. And i thought i could make it well enough.. Oh well, i have this as an assignment.. thanks for this recipe, would give it a go. Lmao @longthroat will not let us cook without meat or snails etc.. Please What can one use as a substitute for okazi and what’s the English name for it. I like how you incorporate the local Igbo names in your descriptions…more grace to your efforts. Hello, pls can I grind the okazi before adding to the soup. I want to add, what kind of cocoa is used for this soup? Is it the one that draws wen pounding, or the other red type? While you can use any Coco yam, the red one is used by owerri people. That slimy one is Anambara ede. And another tip I learnt is to mix achi in a little oil b4 adding to d pot. You will find out it’s easier than adding water to achi. Thanks for this post and all the important facts at the beginning. I really loved your recipe. Thanks for the clarification on the proper leaves to use. All the other recipes I saw were not really sure about the exact leaves for the original recipe. I made the soup and it exceeded all my expectations. What is the 2 main vegetable for this soup?